Herbert • Governor says he signed HB477into law with a delay to prompt discussion. Al Hartmann | Tribune file photo Gov. 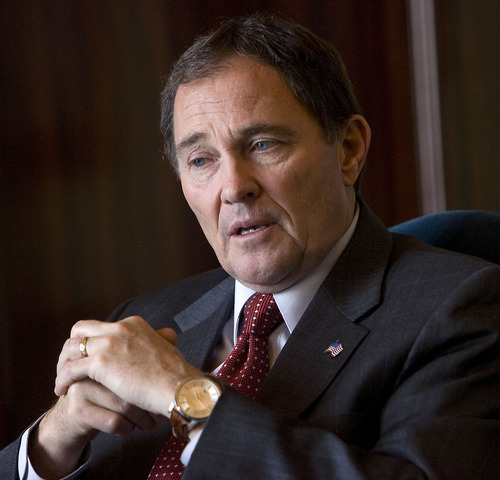 Gary Herbert Tribune File Photo Gov. Gary Herbert is withholding from public disclosure documents, emails or other records regarding redistricting that his office said "would reveal the governor's contemplated polices or contemplated courses of action" before he made his final decision on the matter. AL HARTMANN | Tribune File Photo Lawmakers are counting heads to see if they have the votes to override Gov. 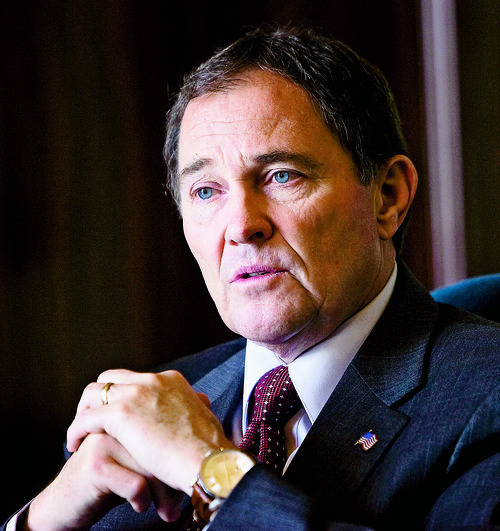 Gary Herbert on one or more of his four vetoes. If legislators muster the two-thirds majorities, it would be the first override in seven years and the first of Herbert's administration. Gov. Gary Herbert said he signed a bill restricting public access to government records because the Legislature could have overridden his veto and, by delaying the implementation, he has created a discussion on public transparency. 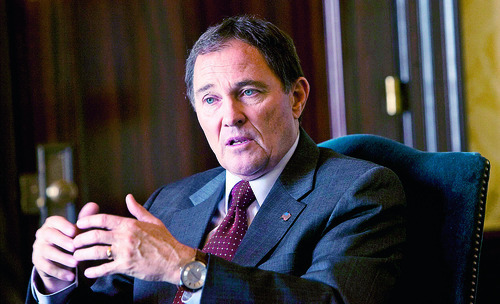 "It was way past veto-proof," Herbert said in an interview Wednesday. "The concern I had was, if I vetoed it, which was an option and, in some ways, maybe an easier thing to do, they override me and have a law that hasn't been vetted, in most people's minds, appropriately and may be bad law." While HB477 got 61 votes the first time the House considered it, several members later recanted their votes amid a storm of public outrage. It got just 42 votes on final passage Friday with the delayed implementation date  eight votes short of the 50 that would be needed to override a veto. Nonetheless, Herbert said his veto would have been overridden and added that by signing it into law Tuesday, he has ensured there will be 90 days where "everyone who has an interest in this issue can come to the table and have an open and frank dialogue." Then he plans to call a special session in June and revise the law before its July 1 effective date. "We've provided a mechanism now for us to get from where we are at to where we need to be," Herbert said. But the national Society of Professional Journalists condemned Herbert's action as dishonest and said it "effectively ends Utah's long history of government transparency." "I am disappointed, both as a journalist but first and foremost as a citizen of Utah, in the actions of our lawmakers and governor," said Tom Haraldsen, president of SPJ's Utah chapter. "The intent of this bill  and the process by which it was rapidly introduced and passed in just two days near the end of the legislative session  negated any opportunity for the public to truly weigh in and have its say about this law." On Thursday evening, opponents of HB477 will hold a rally at the Capitol to voice their outrage over the legislation. Senate President Michael Waddoups, R-Taylorsville, said the way the bill was written, it appeared to exempt all text messages, but he doesn't think that's what was intended. "Our effort is to protect, to a degree, legislators from embarrassing things that they say and do, but more particularly, our constituents," Waddoups said. "I apologize if it went fast and, as a result, we are making amendments and we are making sure the public will have a chance. … There will be a full 90 days when people can give input. We will have public hearings," he said. Herbert said he first heard about potential Government Records Access and Management Act (GRAMA) revisions on Feb. 25, as he was leaving for Washington, D.C. The next week, he heard the issue was being dropped. So, he said, he was surprised when he heard HB477 had been introduced. Despite the process, Herbert said technology has changed since 1991 and the law needed to be revisited. "I think it is disingenuous of anybody to say the current law we have on the books is perfectly OK," Herbert said. The governor said his office received a request when Mike Lee was a candidate for the U.S. Senate for all Lee's correspondence when he was general counsel to then-Gov. Jon Huntsman Jr.
Herbert said it is worth having a discussion on the issue, driven by the principles that public records should be public, private records should be private and guaranteeing that taxpayers aren't being gouged by frivolous requests. "If we do that, we'll get a good product," Herbert said. As it is written, the bill makes electronic communications  with the exception of e-mail  secret, regardless of its content. It would impose new fees for researching and processing requests. And it strips a philosophical statement that government records are presumed to be public unless they contain private information that would warrant withholding the document. The governor says the Legislature would have overridden his veto, had he used one on the bill changing Utah's open-records law. But when lawmakers recalled the measure to delay its effective date, a number of House members switched votes and the resulting 42 in support would not have met the two-thirds majority requirement to surmount a veto.